Vincent Gordon grew up questioning everything and seeking answers. This often led to trouble. Vincent's culturally diverse and large blended family was complete with aunts, uncles, grandparents and more. Life was spent in the south side of Chicago and the city’s suburbs. These radically different worlds gave a satirical young Vincent a wild spectrum of experiences and sensibilities that planted the seeds of his artistic path. Inspired by pop culture and lowbrow art, Vincent merged these influences and found his direction and support from family and many friends. His grandma was and is a consistent source of support and positive energy. Early in his journey, Vincent landed an apprenticeship with sculptor and professor Jeff Thompson. This opportunity helped Vincent develop and learn with other superior artists at his young age. In 1995, cannabis found Vincent. The negative effects of drug use were painfully evident in Chicago; once he felt the positive effects of cannabis, it truly changed his life for the better. The negative social and legal issues that go along with partaking in cannabis fueled Vincent's naturally rebellious spirit. This inspired many cannabis legalization propaganda pieces that led to VG getting into more trouble. Vincent spent most of his last two years of high school in its art wing, focusing on art in a world that didn't consider art a legit career option. Having completed high school and becoming tired of the midwestern hamster wheel, Vincent headed west, finding himself leaping from Los Angeles to Fort Collins, Colorado. He finally landed in San Diego. Vincent initially spent time in SD growing medical cannabis, making art and enjoying the beach. This beachy reality was interrupted. Trouble followed Vincent to California. Vincent's ambitions of surviving as an artist were being oppressed by a toxic, starving artist mentality. Faced with a tough financial situation, Vincent decided to put on a shirt and tie. All was not lost! The recruiting, sales and team-building skills he absorbed in the corporate setting gave him some much-needed organizational building blocks for his art career. After seeing the obvious restrictions of the corporate world, Vincent wholeheartedly swore off the sideways hustle and committed to his path as an artist--sink or swim. In 2008, Vincent met musician/DJ Schugar in San Diego. Together they pioneered The Infusion Project, an artist collective with the mission to empower artists to be successful creators of art for a living. Their goal was to break the starving artist mentality. Through their event production, career development and work, Vincent met many more collaborators including Jim Chelius, Kai Martin, Kiska Zilla and Sean Dietrich. It was in this setting that Vincent’s character-based cartoon collage began to mature. The Infusion Project kickstarted Vincent’s live painting. Vincent paid dues by painting at festivals, rooftop parties, boardwalks, pop-ups, bars, megaclubs, dives, corporate mixers, gallery shows and any place that would have him. He had taken control of his destiny and created a monsta: a Dassa Monsta. In 2011, Vincent was invited to tour with the Identity Festival. It reignited Vincent’s love for life on the road. Accompanied by Sean Dietrich and an all-star DJ lineup, Vincent traveled to 20 cities in 30 days. 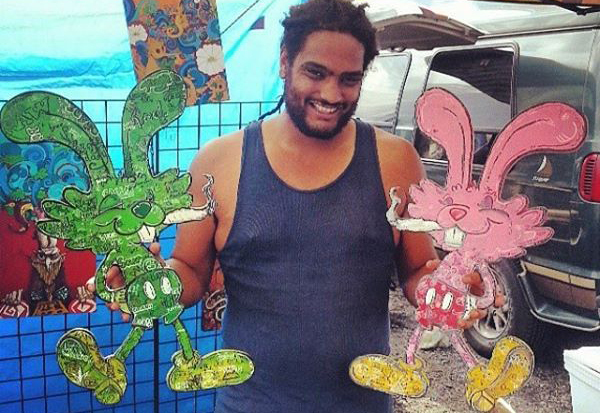 This festival series took Vincent’s newfound live art style to greater heights with his “Dassa Monsta” character series. These Monstas eventually led to Vincent’s 2013 Dassa Monsta Coloring Book. Sean and Vincent continued to tour the USA, the proximity leading them to create multiple collaborative works together. In 2013, at SXSW in Austin, Texas, the first installation of their newly-realized Fear & Loathing Across America series was created: Fear and Loathing in Austin. In 2014 Vincent moved back to Colorado from San Diego to be in a more central, convenient and tour-friendly location. He also wanted a change of pace. Vincent and Sean celebrated their Fear and Loathing Across America series with a six-month showing at Hoodlab in Denver. Continuing in The Infusion Project tradition, Vincent organized local events and toured constantly. 2015 was an evolutionary year for Vincent when he opened DCCX Gallery in Denver’s Santa Fe Arts District with partners Justin and Colin. DCCX Gallery intermingled counterculture, glass art and Vincent’s wacky aesthetic under one roof. Events featuring VG art and glass art, private events, underground DJ parties, hosted dinners and a multitude of other unmentionable gatherings took place within their walls. Vincent’s collection “The Green Movement” at DCCX Gallery featured paintings full of iconic characters and ridiculousness, collaborations and glass from glass blowers all across America. After a year and a half the gallery closed. Like a rolling stone, Vincent got back to touring and live painting. Many positive things came from the DCCX Gallery, one being the birth of the Melty Bros, another power collaboration series with Vincent’s good friend--the wizard Aaron Brooks. The Melty Bros’ show MELT at Grassroots Chicago was a collection of their artwork and apparel created over a 6 month period. Vincent started an intense regimen of collaborations including works with Grassroots, Capital Butane, Sunshine Joy Company, Mood Mats, PBR, High Times Magazine, Grassroots California, nuggs.com, Catchafire Hat Pins, Zane Kesey and a host of others. Collaboration will continue to push Vincent as an artist supporting him to create stronger community bonds and influence counterculture. Through commissions and PBR sponsorships, Vincent has been putting up murals across the country. Vincent’s brother, Isaiah Gordon, has been a vital co-creator in his work since 2010. Today, Isaiah’s unique woodcuts have taken Vincent’s art to a new, more dimensional level. Vincent continues to build the VG brand creatIng jobs, art and opportunities for his family, friends and community. Trouble is no match for VG.